If you are interested in saltwater salmon fishing and are either visiting or living in Vancouver, now is the time to fish the Gulf Islands! May and June are typically the most productive months for chinook salmon in waters around the Gulf Islands. Fishing has been very solid so far this spring with good numbers of chinook salmon and nice lingcod being caught. Crabbing has also been excellent! See full report. 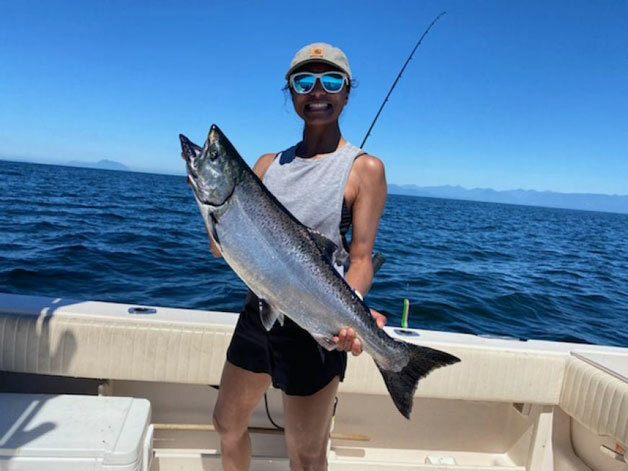 From now until June 30th, Bon Chovy Fishing Charters is offering Gulf Islands fishing packages for $499.00/person plus tax and fishing licence! This rate is available for Sunday to Thursday departures and based on groups of four anglers or more. The package includes two full days of salmon and bottom fishing, and one night of waterfront accommodation. The Gulf Islands fishing package combines consistent salmon and bottom fishing with beautiful west coast waterfront accommodation. Departing from Downtown Vancouver, Bon Chovy's sport fish vessels leave the skyscrapers behind and travel to Gabriola or Bowen Island. This package includes accommodation at a seaside private cabin and 10 hours of fully guided salmon and bottom fishing per day. In season, crab traps and spot prawn traps are also dropped. The beauty of this fishing package is the charter boats are conveniently located in Downtown Vancouver! From the dock location, you are quickly able to leave the city behind and set out for some great fishing, scenery, and accommodation! There is no additional travel time like there is with most British Columbia fishing vacations! These fishing packages are very flexible and Bon Chovy Fishing Charters offers quick and convenient overnight packages and multi day packages. It has a few different fully contained accommodation options that are perfect for small groups or bigger groups of 15 or more. These packages are very popular for convenient corporate getaways and stag weekends! There is variety of different restaurants and shop minutes away from the accommodation.